There comes a point in time when you will come home to your house in only to get yourself irritated looking at your faded wallpaper. The first thing that you might want to do is to remove and replace them with a brand-new one or just have your walls repainted. However, Little Rock, AR wallpaper removal of old and faded wallpapers can be a backbreaking task. Without the right tools, you might end up wasting your time for nothing and ruining your walls as well. Avoid the burden and let the professionals do it for you. Wallpapers are usually installed using heavy duty or extra strong glue to ensure that they will not peel off easily. These adhesives are typically vinyl based which is really hard to remove. There are a lot of DIY procedures that you can try to remove your wallpapers. However, many of them fail, especially if your wallpaper has been glued using vinyl adhesive. 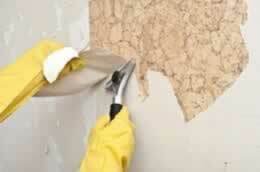 In cases like this, Little Rock, AR wallpaper removal from experts like our company can help you with your problem. You may think that it will cost you a lot. But, if you think about all your failed efforts, your only option is to hire a professional service for the task. Right Tools – Heavily glued wallpaper can be very difficult to remove. Experts who do wallpaper removal in Little Rock, AR have the necessary equipment to peel these stubborn wallpapers off your wall. Knowledge and Experience – A professional knows if your wall has been primed correctly before your old wallpaper was glued. If that is the case, they have the right equipment and Little Rock, AR wallpaper removal methods to get rid of your old wallpaper. Wall Damage Prevention – Our specialists know how to safely conduct wallpaper removal in Little Rock, AR without harming or putting too much damage on your wall.